Shakespeare’s works can be introduced and taught to students of all ages. To get your younger (elementary and middle school) students interested in reading Shakespeare, have them first read some books that will entertain and teach them more about the time period. I will review and suggest some different books in this category over the next few weeks. 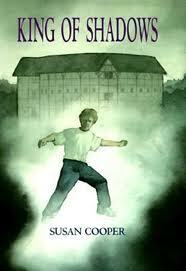 Susan Cooper’s King of Shadows is about an American boy, Nat, who is picked to perform with a new acting company who will perform at London’s new copy of the Globe, the theater William Shakespeare performed in. Nat goes to bed sick one night, wakes up well, but finds himself in the 16th century expected to perform at the original Globe with his costar, William Shakespeare. Reading this book will give students a feel for the theater, the time period Shakespeare lived and performed in, and will introduce them to the play A Midsummer Night’s Dream. A website that contains discussion questions and suggested activities for this book is: http://www.multcolib.org/talk/guides-king.html. Very helpful, I may have to give this technique a test. Previous Previous post: Shakespeare: To Read or Not to Read?